You Can Turn Charcoal and Peanut Butter into Crystals - Fact or Myth? You can turn coal and/or charcoal into crystals and/or diamonds by heating up the coal, putting it in peanut butter, and then freezing it in ice. Is it Possible to Make Diamonds from Coal and Peanut Butter? In other words, the videos online that shows coal and peanut butter turning into crystals after being set in ice are all fake. None of these people actually put coal (or charcoal) into peanut butter and pulled out a crystal / diamond. It doesn’t matter if you freeze it, or how much you heat the coal. These videos are simply attempts to get you to click on them so they could wrack up views (i.e., they are clickbait). With that said, scientists can actually turn things with carbon into crystal (including coal, charcoal, and peanut butter), but they have to do it in expensive labs, under crazy conditions, over a long duration of time, and even then they only get tiny crystals out of it (for “how to make diamonds out of peanut butter,” see: How To Make Diamonds Out Of Peanut Butter [in a lab]). Not only that, but just in case science was wrong and those videos online were right, we tried this experiment… and, on that note, we can confirm all you get is a lump of coal / charcoal covered in peanut butter. Just like you would expect. So to be clear, that Blossom video that shows “10 Tricks You Didn’t Know You Could Do With Your Food“… is not real (I’ll feature a video below showing the clip from Blossom so we are crystal clear on what I’m referring to). 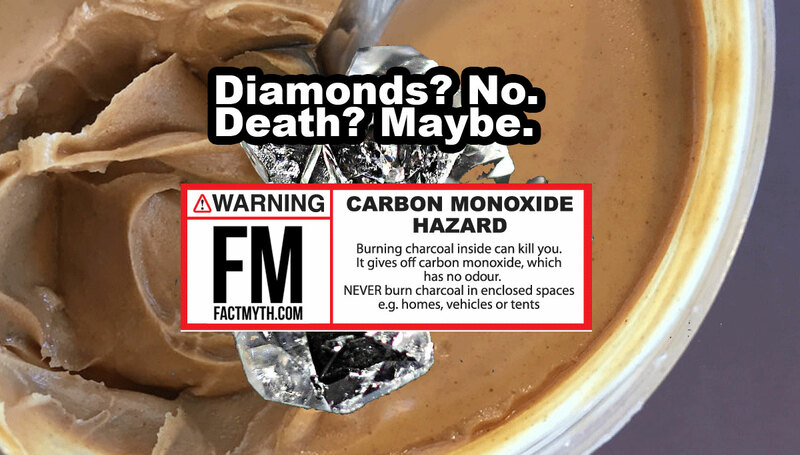 Also, Blossom (and especially the YouTubers who pretend to do this in a microwave) should issue a warning, because lighting charcoal in your house is actually dangerous and could result in… literally death (at least according to the warning label on charcoal). Can I turn coal and peanut butter into crystals in the microwave? Microwaving these things in a plastic container is a really bad idea, especially if you do it indoors where you might breath in the resulting smoke, carbon dioxide, and toxic chemicals. There is no truth to the peanut butter coal myth, so definitely don’t do the microwave version. So again, to be clear, it is literally impossible and actually highly dangerous to make diamonds at home using a piece of coal, peanut butter and a microwave. Is there any real way to make crystals? Yes, there are a few fun ways to make crystals at home. However, none of them involve peanut butter. Here are a list of ways to actually make actual crystals at home without destroying your microwave or endangering your family. Bottomline: Anything with carbon can be turned into a crystal under the right conditions, so you did learn something from those viral videos (FACT: coal, charcoal, and peanut butter are all carbon rich and can be turned into crystals… under the right conditions, in a lab). However, you can’t do this at home, and burning charcoal inside is dangerous. Thus, you are more likely to injure yourself or your family playing with hot charcoal inside than you are to make a crystal (low chance of injury; zero chance of making a crystal). You can’t turn a coal and peanut butter into a crystal at home. But you can die from carbon monoxide poising from burning charcoal inside. So, don’t try it at home… but if you do, don’t try it indoors. How To [actually] Make Diamonds Out Of Peanut Butter [in a lab]. I09.com. No you can’t turn peanut butter into a diamond or crystal. Medium.com. if there is no pressure on the coal, then obviously it’s not going to go from layers of black material to a clear solid crystal. it’s kinda common sense? logic? whatever you want to call it? Further, the amount of pressure needed can’t be recreated at home. THIS IS YOUR BRAIN N DRUGS– ANY QUESTIONS? Funnily enough though, to the point of this article, coal, charcoal, AND peanut butter all have the carbon needed to make a crystal. The problem isn’t which carbon rich substances we choose, the problem is people thinking that smearing peanut butter on hot coal or charcoal and sticking it in ice at home will create a diamond/crystal. That simply isn’t true, to make crystals from a carbon rich substance, you need to be in a lab with the proper equipment.